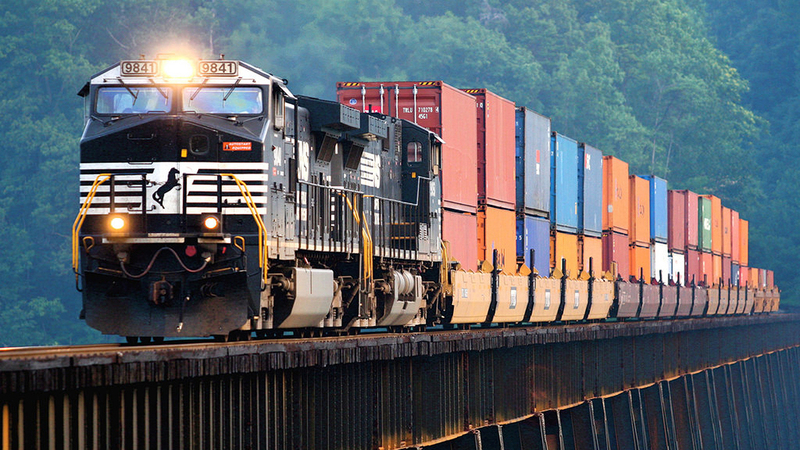 A gain in intermodal partly offset what was otherwise a dismal week for freight rail traffic, according to figures for the week ending March 23, 2019 released by the Association of American Railroads (AAR) on March 27. U.S. weekly rail traffic was 503,017 carloads and intermodal units, down 4.5% compared to 2018. Total carloads for the week ending March 23 were 236,817 carloads, down 10.9% compared with the same week in 2018, but U.S. weekly intermodal volume was 266,200 containers and trailers, up 2.1% compared to 2018. Two of the 10 carload commodity groups posted an increase compared with the same week in 2018. They were petroleum and petroleum products, up 2,233 carloads, to 12,132; and motor vehicles and parts, up 422 carloads, to 17,102. 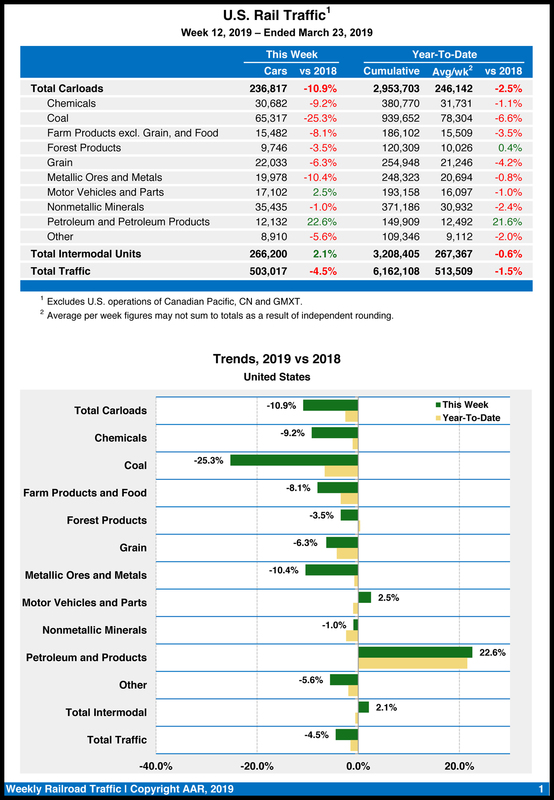 Commodity groups that posted decreases compared with the same week in 2018 included coal, down 22,096 carloads, to 65,317; chemicals, down 3,110 carloads, to 30,682; and metallic ores and metals, down 2,327 carloads, to 19,978. For the first 12 weeks of 2019, U.S. railroads reported cumulative volume of 2,953,703 carloads, down 2.5% from the same point last year; and 3,208,405 intermodal units, down 0.6% from last year. 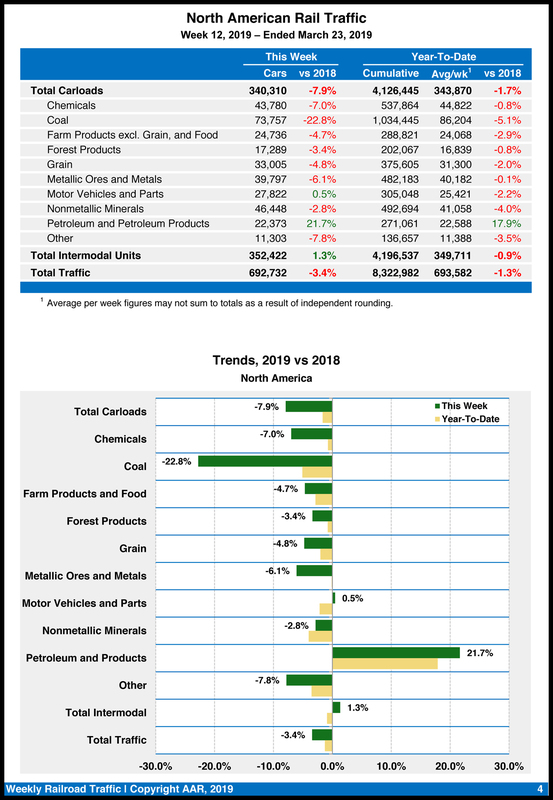 Total combined U.S. traffic for the first 12 weeks of 2019 was 6,162,108 carloads and intermodal units, a decrease of 1.5% compared to last year. North American rail volume for the week ending March 23, 2019, on 12 reporting U.S., Canadian and Mexican railroads totaled 340,310 carloads, down 7.9% compared with the same week last year, and 352,422 intermodal units, up 1.3% compared with last year. Total combined weekly rail traffic in North America was 692,732 carloads and intermodal units, down 3.4%. North American rail volume for the first 12 weeks of 2019 was 8,322,982 carloads and intermodal units, down 1.3% compared with 2018. Canadian railroads reported 82,708 carloads for the week, essentially unchanged from 2018, and 71,236 intermodal units, up 0.5% compared with the same week in 2018. 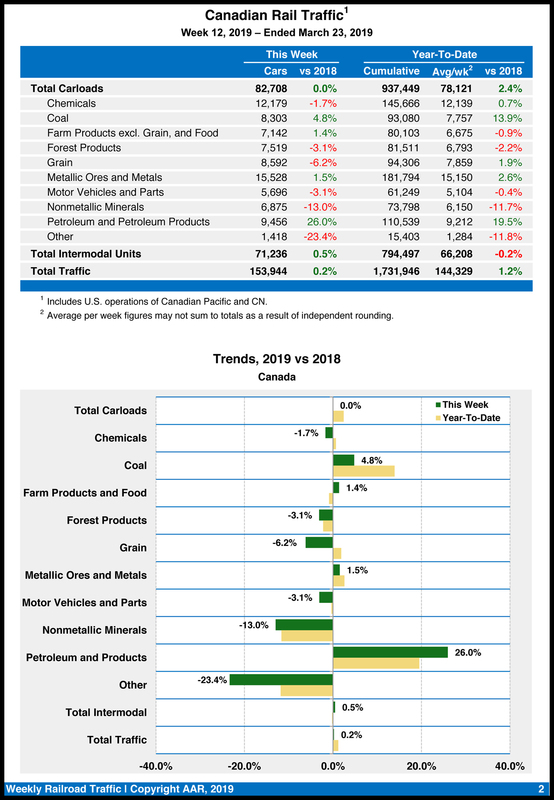 For the first 12 weeks of 2019, Canadian railroads reported cumulative rail traffic volume of 1,731,946 carloads, containers and trailers, up 1.2%. Mexican railroads reported 20,785 carloads for the week, down 1.6% compared with the same week last year, and 14,986 intermodal units, down 7.2%. 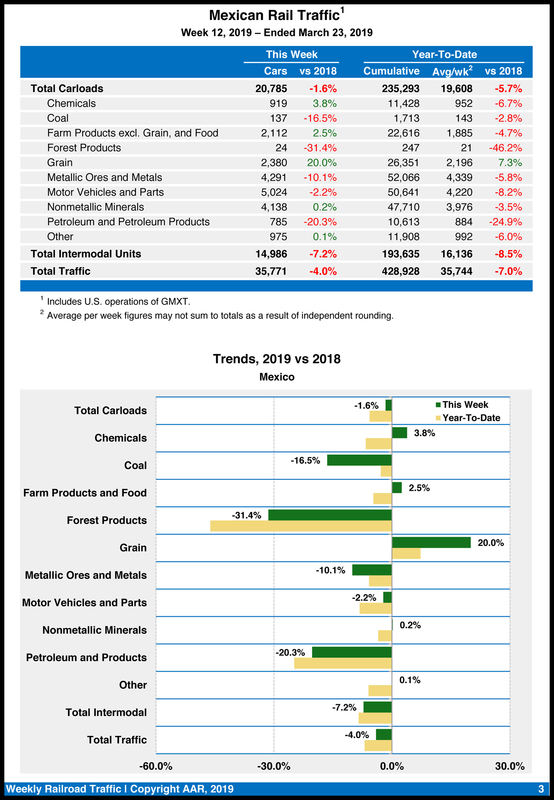 Cumulative volume on Mexican railroads for the first 12 weeks of 2019 was 428,928 carloads and intermodal containers and trailers, down 7% from the same point last year.